Send an exquisite birthday gift with juicy premium pears. These delicious pears are buttery-smooth and sweet enough to be dessert, making them a gift that won't soon be forgotten. 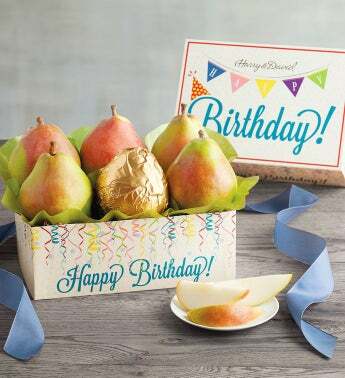 The pears arrive in a special box with artwork of multi-colored streamers and flags, and the words, "Happy Birthday" are emblazoned on the top and side.